The smell of sawdust and the sound of a saw (or five) are two of the things you notice when you enter the Technology and Engineering Education Department of Darien High School, but don't worry, you'll get used to it. The Connecticut Technology and Engineering Education Association selected the department as the 2013-14 Connecticut Technology and Engineering Education High School Program of the Year. "Basically our philosophy has always been to understand the culture of the community and our culture herein Darien is very, very different than most other towns around here," Department Head Leon Strecker said. The teachers, he said, "take a look at who our population is, what they need and we focus on that, and the state has seen that this is something that's really working for our kids." Recently, the department started a new class where they'll be sending certain "high-end students" off into the engineering field. It will also be bringing in people from all over the engineering community to talk about their jobs. "There's no other class in the state that's like that," Strecker said. "It's things like that that may not be appropriate in Norwalk, it may not be appropriate in Middletown, but it's very appropriate for us here. By understanding who we are and what we are, things have really come together, and our kids have given great feedback about where they're going and what they're doing and how we're affecting them. I think that's why we won this award." Teacher Jeromy Nelson said another difference is that the department has no closed doors. "We believe that when a kid takes a tech ed class they may be taking an architecture class or a woodworking class or systems and they may have one of us listed, but really they get three teachers for the price of one," Nelson said. Strecker said the kids understand that, too. "They'll be here before school, after school and it doesn't matter who they come up to, they'll be helped," Strecker said. There are just more than 500 students in the department spread throughout several different classes, such as woodworking, architecture, drafting class and systems of technology. "I think we have a really good mixture of the classical woodworking, but also the very, very high-end stuff like fuel cell and [Science Technology Engineering and Math] that allows us to see different kinds of kids," teacher Rich Reynolds said. When he told his class about the award, Strecker said the students were "proud as peacocks." Nelson said the students really feel the department is a place of belonging for them. "We tried to explain to them that it was an award that they won, too, because it's their accomplishments that really highlighted what we tried to instill in them," Nelson said. Senior Taylor Cockerill thinks the department is "a really cool place." "The teachers especially are really caring, so they all just like team up to help you," Cockerill said. Currently, the only girl in the woodworking class, Cockerill said she loved tech ed in middle school, but hadn't gotten a chance to take woodworking until this year. "So now I'm just in a class with a bunch of freshmen boys," Cockerill said. "But it's fun because I made friends with all of them." 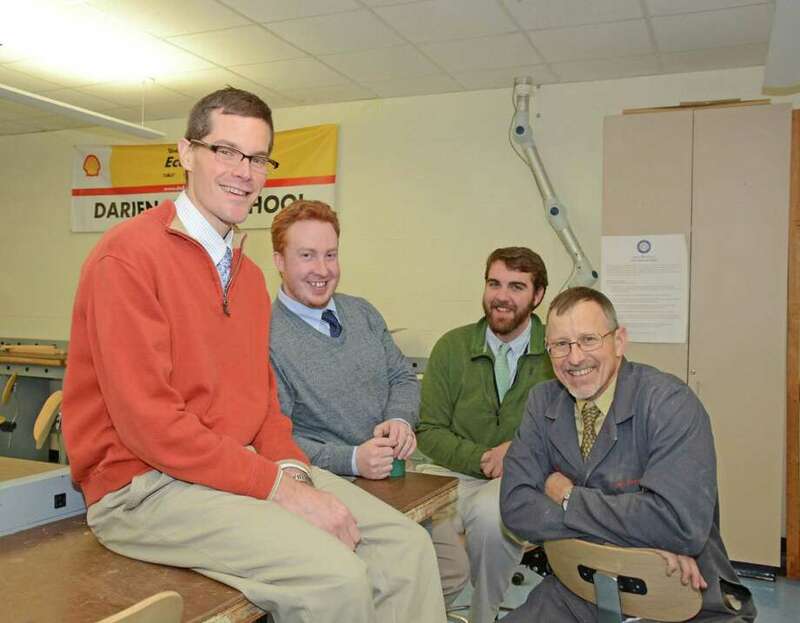 Strecker has been with Darien High School for 21 years, Nelson has been there for 10, and Reynolds has been there for six, and all three agreed that they work well together as colleagues and friends. "I'm coming toward the end of my career and these guys are just taking the ball and running with it," Strecker said of Reynolds and Nelson. "I can't wait to see what this place is going to be like in a decade or so."